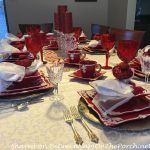 Welcome to the 75th Tablescape Thursday! Have you ever wondered about the origin of those little candy hearts with the cute and sometimes corny messages? Last year, I had some fun putting together a tablescape using them in some creative ways. Since Valentine’s Day is rapidly approaching, I thought I’d share that tablescape again, along with some interesting facts about this well-loved candy. Salad plate is Homer Laughlin. There are no marking on the back, but a sweet reader of BNOTP, Caryl, emailed to say she believes the pattern may be called, Georgian. Thanks, Caryl! I found six, 5-piece place settings (plus serving pieces) on eBay for around $35…including shipping. Stumbled across this International china, pattern Glenwood, while out antiquing one day. They were marked down…20+ pieces for $14. Yipee! I filled in with a few additional pieces on eBay. See, you really don’t have to spend a lot to have several sets of china for mixing and matching. Just keep your eyes out for the bargains when you are thrifting or antiquing. Lace chargers are from Horchow online, a couple of years ago. NECCO, the company that manufactures this popular candy, must make over 100,000 conversation hearts a day, every day, to meet the demand that occurs during the six weeks prior to Valentine’s Day. During those six weeks, over 8 billion candy hearts are sold! Each year, NECCO creates the hearts based on a different theme…and each theme has ten special sayings that will be printed on the hearts. In 2007, the theme was pets…with sayings that recognized the love we all have for our pets. For 2010, NECCO decided to discard all their previous phrases and they asked the American public to tell them how they express their love. 2010, also, saw the addition of lots of new, bolder colors and flavors, including Strawberry, Green Apple, Lemon, Grape, Orange and Blue Raspberry. Plus, they are making the candies softer, so they are easier to eat. If you miss some of the older sayings and would like to have your own conversation heart-candy custom made with the phrases you choose, you’ll have to buy a full production run, or about 1.7 million candy hearts. The good news is, they stay fresh for about five years…so you’ll have plenty of time to enjoy them. The pen really works and I ate one…tasted pretty good. Susan, you're tablescapes are always so lovely! Checking your blog is my favorite way to spend my Thursday morning. All the tablescapes are such inspiration. I'm having my first giveaway…me and CSN Stores, that is!…so please stop by and leave a comment to enter! Your dishes are FAB! The conversation hearts are wonderful and how smart are they to come up with customizable hearts! Your table is just delightfull…I love all the hearts and loved hearing all about the candies. I adore the soft colors, and all of your thoughtful and beautiful touches. The conversation hearts are so cute! What a lovely romantic table. Going back now to take a better look ~ you did such a wonderful job, as always! What a romantic Valentine's Day table. Love the edible conversation heart dealies! So cool. I love the lighting and the layering of the different plates. The textures are great! Susan, I just love the vintage china-the International is just perfect for Valentine's Day. Allie's Sweet 16th birthday will be the day after Valentine's and I've been buying bags of those hearts with a special tablescape in mind for her. Thanks for hosting! Hi Susan! This is a very "sweet" post! Because I was not blogging last year this time I wouldn't have seen your beautiful table unless I searched for it! I love that you reprise some of your brilliant tablescapes to enjoy! The informaion about necco's little hearts was very informative and fun. I am so glad you are enjoying Dinner is Served by Arthur Inch. I think it is so fun to see how things (not just dinning practices) evolved. Thanks for the other recomendations too. I see many books I would be interested in. As usual, thanks for hosting!! I look forward to TT every week. So cute, I am going to have to do up a table like this for my family! Love the written on heart at the top. Tid-bits of history like these are always fun! Susan, love this "Sweet Talk" tablescape! You have created a beautiful tablescape with the candy hearts and the glow of candles. Love that pink boa around the apothecary jar too. So pretty! "Love is in the air" at your home Susan, and I have always loved those little lollies. Your settings are beautiful as always and I have missed my couple of weeks away from your parties. I'm home from our Summer holidays with lots of tablesettings for the next couple of weeks for your party. 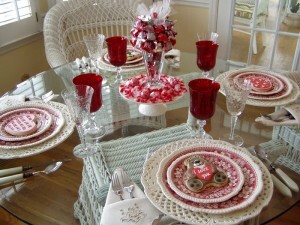 Susan, I love this sweet Valentine inspired tablescape! You just gave me so many good ideas for my next table setting. So sweet. Love all of the pink and your use and history of conversation hearts. what a great Valentines Day table!!! Love the theme and the feather boa is a great touch. I continue to 'drool' over those lace chargers…LOL. Oh, those edible love notes are awesome. Could use those to leave notes in the kids lunchboxes. I learned so much from this post very interesting. Thank you bunches for hosting. Such a sweet table. I will be doing Valenine's tablescapes the next couple of weeks as well. they are jsut so pretty to put together! Thank you for a fun Thursday post! I really enjoyed the history of the first candy hearts and sending a lock of hair! You never fail to provide such clever, pretty and interesting posts! I love your Valentine's theme (great minds must think alike ;p). I just can't tell you how much I am enjoying touring the tables here each Thursday. Thanks for the invite! Cute, cute, cute!!! The story about the conversation hearts is very interesting! I'm also using the little heart shaped ramekins, mine are red! Looks like YOU are ready for Valentines Day FUN!!! I will have to do a Valentines Table next week… FAB idea! P.S. Come vist… leave a comment and WIN!!! Susan…I love the pink fluff in the middle! Beautiful dishes too. Your blog is always filled to the brim with eye candy and tons of amazing ideas. Thank you for sharing your ideas with us and having this fabulous party each week. I love it! Stop by and see my tablescapes. I have had a ton of fun putting them together this week. So lovely and romantic, Susan! I love the pink tulle and feather boa. Wow! Sounds like these candy hearts have been around as long as candy corn ~ which I found out this year they make for Valentine's Day, too! Found those at Tuesday Morning and, of course, had to get some of those! Your table is so beautiful. I will definately use many of these ideas. Thanks for hosting such great blog parties. I love those little hearts…what a great inspiration for a Valentines Day Tablescape. The china is oh so pretty too. I'll be back to linkup a little later! I'm so in "love" with your table. It is so sweet and romantic. Thanks for all the info on the candy hearts. I have already go mine this year and the flavors are great and soft too. I am going to try the candle with the hearts…so cute. I was going to join this Thursday, but not quite ready. Next week for sure if I can figure out how. What a pretty table setting. I almost bought a bag of the hearts a couple of days ago, and decided I did not need them, so passed them up. Some of the flavors I like – some not so much. Lovely table as always! I had not even thought about Valentine's Day yet, but I've been inspired! Susan….always fun and inspiring! Love the white chargers….and the vintage plates. Thanks! What a unique and fun tablescape! You were extra creative with every element! The honeycomb candles, the feathers, and the way you did the message hearts all came together so beautifully! Susan this is so beautifully done for Valentines Day! The pink boa is precious! I loved the history lesson. I bought some hearts to use in my Valentine tablescape. I decided to eat one and it was different this year, sour…ick! I do love how they look. I love your Valentine candy inspired tablescape! So cute and fun. I actually used these candies on my baby shower table this week…they are so fun..thanks for the background info too! I love the apothecary jar filled with them and the candle. Those pink flowered plates are just beautiful! Great Candy Heart Centerpiece…really sweet idea! In more than one way. Grins. I don't know how you come up with all the ideas. Beautiful as usual! I love the foof in the middle of the table. So very girly!! The conversation hearts were my favorite valentine treat. I used to savor each one and make them last for days after Valentine's Day. I love those little conversation hearts. I like how they update the sayings each year to correspond with the current times. I had purchased 12 of those little heart dishes at HG and then had more then 12 gals coming next week so I had to return them as I did not have enough and I never thought to look at Michaels for them. Looking forward to seeing you next Friday. Susan, you table is enchanting! I love the edible notes!! I just checked one of my rose tea plates as it looked similar but it was not quite the same. Love the little heart dishes. Another winner!! Happy Heart Day is in full bloom! As usual, Susan, your tablescape is fantastic! Look at the way your gorgeous stemware sparkles in the light! Beautiful, as always. Happy TT, and of course a resounding applause ! Beautiful table (as always). I love Thursday so I can see what you are going to put together. Susan….what a fun and romantic and PINK table…..LOVE IT! Is the feather piece around the jar centerpiece a pink boa? Just curious. Also, what is around the stems of the crystal goblets? So cute and has me inspired! What a pretty table. And, I love the facts about the conversation hearts. So fun. I've been reading along for a while but just started my own blog…I am going to have to get better about photographing my table so I can join in! I love your blog. Hi Susan, I just love your pictures and the info you provide! You have inspired me to use the dishes and accessories I have been collecting for so long (mostly in secret, stashed where Hubby only sees them when necessary!). Today I love the idea of using the little frou frou items, like the pink feather boa–I'm sure we have some of those in the dress up box! I could see lots of engagement rings coming out at this Valentine's Day table. Gorgeous as usual!!!! Thanks for the inspiration! What a fun, fantasy table – you've got every detail covered! It's totally Love-ly! This is the first time I've linked to Tablescape Thursday. Thanks for the oppportunity. I "heart" this post & your blog! I think this is the best way to spend a Thursday evening;-) Thanks for hosting. Cute post with good info and sweet table settings (as usual!) How you keep up with it and working full time is a mystery to me! Thanks for hosting again…and congratulations on a milestone. 75 tablescape blog posts! Your post is so cute. Really fit for the upcoming Heart's Day. How I wish I could better settings on this special day. Thanks for sharing and giving me the opportunity to join and the motivation you share. This is a darling tablescape. I remember it, so cute! And you and your friend's dish room have inspired me to redo my pantry cupboard for a Spring project! Love the organization of the flatware in plastic bins labeled and all. Hi Susan; OH I just Love your table setting…. So very Romantic, and the history lesson on the candy was really great… did not know any of it…. You really inspire me alot with your table scape. Have a great day. 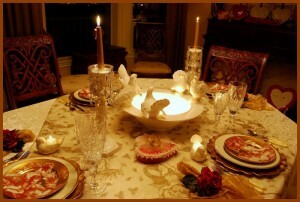 I really like the pink feathers in the center of the tablescape, but I especially love the beeswax candles. Great idea, but of course you are full of great ideas! What a wonderfully festive and entertaning post, Susan! Your pink plates are pretty, and I love the way you've mixed-and-matched! And you taste-tested the edible love notes! The lengths to which you go for your readers is admirable, Susan! No wonder we all love you so. 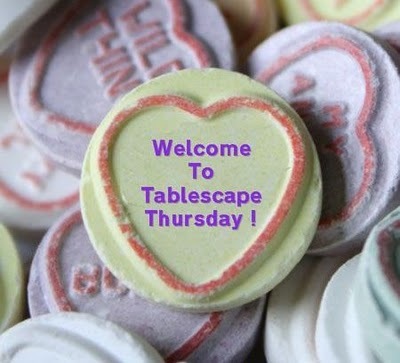 Happy Table scape Thursday~~~wow amazing you have been doing this for awhile? 75 times!! Thank you for letting us join in the fun! The little sweets are called "Love Hearts" over here. Susan, is it my computer or what. Right after your post where your 100+ participants are to be, there is an obtrusive advertisement called "Love Happens" + a video to watch and then on to this weeks Met Monday. Not a single TT that I can find. Please help me, If I've looked in the wrong place. I hope I'm not the only one who has a screwed up PC. And, when did ads start popping up where ever they damn well please on blogs? I find that obtrusive, obnoxious and down right invasive. Fondly Jackie A HUGE Fan. Darn! I read every one of your comments hoping someone would know that name of that Homer Laughlin china! It looks VERY similar to a set of Homer Laughlin that I collected for years. (Georgian Countess) I finally had a complete twelve place settings then moved cross-country. Somehow the moving company "misplaced" that box! As soon as I saw your place settins I was taken back in time. I may have to start my collection again. I LOVE Homer Laughlin! Gorgeous! It's absolutely beautiful and very festive for the approaching holiday. You are an incredible inspiration. Thank you so much for sharing your lovely talents…and tables with us each week. I love your pink dishes! Very pretty table. Hi Susan, I'm experiencing the same thing that Jackie, Just A Dreamer is with regard to lack of links. I think I might be going into a bad case of TT withdrawal. Your Valentine Tablescape is so sweet. I especially love those beautiful chargers. I enjoyed the Necco conversation heart history. I loved being able to share this information with my family who likes to tease me about my fascination with surfing the tablescapes. This week they learned something as a result! Love, love, love your site and all your posts. What happened to Mr Linky? I don't see him or any participants on your blog for this tablescape. Oh how romantic! Mr Linky must be hanging out with my computer as I had another all day and 200 dollar date with DELL, the 2nd since Sept. So no table from me.. I will looking at everyone's before something happens again! I'm not sure why Mr. Linky is down. His site appears to be down, also, but I was able to send a help ticket in via his blog. Hopefully he will fix the problem soon. I may not post again until Sunday evening so you will have plenty of time to visit the tablescapes once he is back up and working. Your tablescapes are always an inspiration! I love the candy hearts used as a theme to build on. 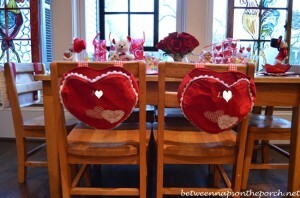 It makes quite the romantic Valentine table with a touch of whimsy! Your table is gorgeous!!! I especially love your china and the lace chargers. So beautiful! You can't beat conversation hearts. I saw an adorable wreath made with them on another blog today. So cute! Love & blessings from NC! Great post! I love the history of the message hearts. Being a person with only one set of good dishes, I enjoy seeing other's tablescapes so much. Hi Susan, I appreciate your reply to my email it was helpful. Thanks. I adore the plates with the yellow and pink roses. If ever you tire of them you know where to find me! Beautiful table!! You are so talented!! Beautiful table!! You are so talented! Delightfully romantic table. The sweet china is the pattern my mom had. I'm the lucky one who now has the few remaining pieces. It's so sweet and delicate. I hope to share my pieces on a post sometime soon. Loved seeing these on one of your tables. very cute, Susan. I got some heart bowls at Michael's too. I can't wait to do a Tablescape with the china I got this summer and the matching ruffled edge heart bowls. Gotta love the new messages…text me. Absolutely Beautiful! I have been following your site for some time but have just recently started my own blog. I hope you will visit me there! Just beautiful- as always- I love the candy hearts in your tablescape. You are so very talented!!! Your table is so pretty! I love how the boa makes it all look so soft and romantic. Hi Susan – I linked up – all about organizing! Ohhhh my goodness those Homer Laughlin plates! I have been searching forever for that style. My grandma used to have a few pieces and I adored them when I was little, however, either her plates were never marked with an id number or it was rubbed off. After all my research I've never seen that pattern made in that shape except for your blog and well my grandma's plates, they perfectly match. The plate shape, decorated edging, looks like it is from the republic line and the pattern is countess. So Homer Laughlin Republic Countess? Wish I knew. I would love to own a set. Lucky you they are beautiful and so is your entire V-day tablescape! Thanks, Sherry! The boa I used was just one long, really fluffy feather boa and I just wrapped it several times around the centerpiece. I didn’t do anything special to the feathers to make them stand up, they were just that way on their own. I purchased the boa in a local “tea room” back when I was part of a Red Hat Group. If you weren’t yet 50 you couldn’t wear Red and had to wear pink. Wish I still had that problem! 🙂 I remember the boa was a bit pricey so maybe it’s just a really good quality boa because the feathers were very fluffy and stood out on their own. What did I use the tulle on? I don’t see that on the table. Did I mention that in the post somewhere?